Shortly after its debut at the 1928 Motor Show at Olympia, a sporting version of the little 847 cc 'M' type Midget was produced specifically to compete in the Brooklands Double Twelve endurance race. It was because racing was indulged in by private individuals quite successfully, using fairly standard production cars, that Cecil Kimber decided to channel efforts into a small competitions department at Abingdon. He was very mindful of the tremendous sales potential of offering tuning services to prospective customers and existing ones not to mention the enormous benefits derived from factory backed and privately entered cars winning competitions bearing the MG badge. Earlier attempts by MG to compete with the rather sedate 18/100 in the Double Twelve had proved rather disastrous, but by complete contrast the 'M' type Midget's venture was very successful with the 5 cars storming away with the team prize after an arduous race at high speeds. 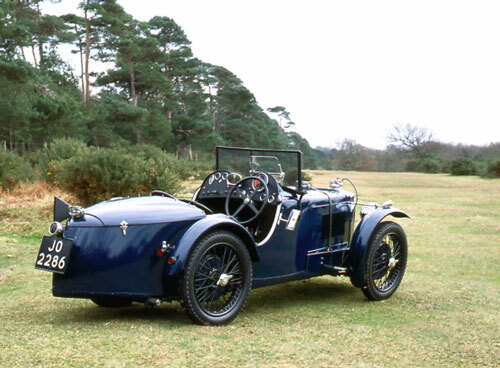 As a result of this, a Double Twelve replica was made available to the public and with a limited run of 30 cars they were very soon in the hands of enthusiastic amateur racing drivers. After appearing at the 1931 Motor Show for the fourth time, the 'M' type was eventually phased out in 1932 with over 3,235 models being produced. Several special Midgets were produced specifically for record breaking purposes and during 1930 the Abingdon factory prepared a prototype designated EX 120 and it was this project that was destined for the Company's first attempt at International speed records in the hands of Captain George Eyston and Ernest Eldridge. They were keen to secure the class H speed record for cars up to 750 cc and the capacity of the 'M' type was reduced from 847 cc to 743 cc for this attempt. With a modified chassis and special boat tailed body the car was ready for a record attempt over in France at the Montlhery track in November 1930. The first attempt failed, but rapid modifications which included the fitting of a supercharger ensured success with Eyston taking the car to over 100 mph on several occasions in February 1931. There was great delight back in Abingdon with the achievement and following this success Kimber immediately released details of another project for a special racing Midget. Originally designated the 'C type Midget, it soon became better known as the Montlhery Midget. With EX 120 being used as the test bed for future models, the chassis and engine details had been sufficiently proven on the open road and extensively at Brooklands race track for the tooling to be put in hand for the 'C type and its sports car equivalent the 'D' type. The overriding difference between EX 120 and the new 'C type was in the bore and stroke of the engine which was to be 57mm x 73mm giving a cubic capacity of 746 cc whilst the new 'D' type retained the same 57mm x 83mm of the 'M' type. A single downdraught carburettor was inherited from the 'M' type and a new innovation on the 'C type was the installation of a scuttle mounted bulk oil reservoir which was float chamber controlled. Strictly with advantages for competition use it obviated the need for checking the oil at hectic pit stops which generally entailed removing bonnets, checking dipstick levels etc. A set amount of oil could replenish the reservoir very quickly via the scuttle top mounted quick filler and most importantly the correct level of oil was always maintained in the engine sump. This system was of great benefit to the later supercharged cars which were particularly heavy on oil consumption. The transmission and clutch were chosen mindful of the increased power outputs generated by the more powerful engine and with margins to cope with supercharging on the later cars. A specially developed twin plate clutch transferred power from engine to gearbox which was the hefty ENV 4 speed crash change variety and final drive to the rear wheels was through straight cut spiral bevel gears. The chassis frame was made from straight and parallel steel channel which underslung the rear axle and swept over the front axle. Cross brace tubes passed through the side members and were affixed with brazed flanges, the end result being a very strong yet flexible structure. Semi-elliptic springs were fitted all round that floated at one end in bronze trunnions. The braking arrangements were cable operated which allowed a system that was unaffected by axle movement and also was not prone to most forms of accidental damage. A racing-type fly-off handbrake was coupled into the same operating system as the footbrake and thus enjoyed the same efficiency. There was independent adjustment of all four brake cam levers via wing nuts and a main handwheel control adjacent to the gear box remote control that allowed adjustment of the brakes whilst the car was in motion. There was also an adjuster by the steering column for the rear Andre Hartford shock absorbers so they could be trimmed from within the cockpit to compensate for weight reduction as fuel was being used. The standard body was a two seater aluminium panelled item which had a pointed boat tail similar to the 'M' type. The hinged top panel concealed the spare wheel and the 15 gallon fuel tank which had a large diameter quick-fill fuel flap mounted at the very tail end of the car. At the front of the early cars was a cowled-in radiator that was distinctive of the hastily prepared item that adorned the EX 120 record car at Montlhery. The top scuttle for the first time sported two humps directly in front of driver and passenger to deflect wind supposedly over the heads of the occupants. These humps were to become the hallmark of many an MG that was to follow over the ensuing 25 years. The instrumentation was to a high level and of very good quality and commensurate with the International Road Racing standards of the day. The final trappings of this racer were a gauze mesh windscreen, leather bonnet straps, and an external Brooklands type exhaust that terminated in a large fishtail. The complete package which very much looked the part, appealed instantly to the racing fraternity and was very conservatively priced at £295 being nearly £100 more that its standard sports car counterpart, the 'D type Midget. Nonetheless the car was considered to be very good value for such a highly specified vehicle and it sold very well, albeit in very small numbers, with only 44 being produced in total. Racing and competition successes that ensued were many and various, probably the most notable was the first showing of thirteen 'C types at the Brooklands Double Twelve Race in May 1931, where the cars secured the coveted team trophy and also one of the them winning the race in the hands of Lord March; 2nd to 5th place also going to 'C types. Engine: 4 cylinder in line. Capacity: 746 cc. Bore & Stroke: 57mm x 73mm. Carburation: Various dependent on type of head. Power Output: Various dependent on type of head, between 37.4 bhp unsupercharged and 52.5 bhp supercharged. Gearbox: Four speed, ENV non-synchromesh. Brakes: Cable operated. Early cars: Front 8" drum. Rear 8". Late cars: Front 10" drum. Rear 10". Clutch: Twin dry plate. Suspension: Semi elliptic front & rear in sliding trunnions. Wheelbase: 6' 9". Track: 3' 6" front and rear. Cost new in 1931: £295.